Nickel Alloy Pipe Fittings that we offer are fabricated under the supervision of experienced technicians to ensure no scope of defects. Our Fittings are dimensionally accurate and highly durable in nature due to its strong and sturdy construction. We make available Pipe Fittings in different sizes and other technical specifications to meet the diverse demands of buyers. 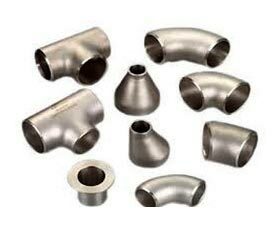 We can provide Nickel Alloy Pipe Fittings in small as well as bulk quantities.